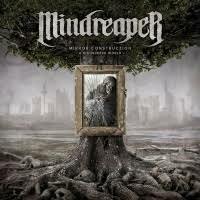 Since 2001, when they were just collection of dudes writing songs in Lauterbach Germany, MINDREAPER’s take on Death Metal has gained the attention of some of the most well-known Thrash and Death acts of Germany. MINDREAPER has opened for VADER, SQUEALER, SIX FEET UNDER, SODOM and Shakespeare-inspired Symphonic Metal band REBELLION throughout their career. Their Sophomore release “Mirror Construction (… A Disordered World)” is an unchained pack of hunting hounds running free, flushing out their prey. Inspired by a tape of IRON MAIDEN performing live, MINDREAPER has spent the last seventeen years honing their powerful sound to a razor’s edge, and they’ve certainly crafted a deadly weapon with their latest release. With Melodies akin to BURDEN OF GRIEF, MINDREAPER injects a very human element into their all-out rage tracks. “Enigma” screams out of the gate and tramples all stupid enough to stand in the way with a cymbal heavy drum tracks. “Bull’s Eye” is a gas tank explosion, roiling flames and Sebastion “Sucking”’s dreadful growls surround and engulf in an instant. The name MINDREAPER was chosen to represent the death and collection of your sanity, your humanity, and they couldn’t have picked a better name to encapsulate their chaotic evil approach to Death Metal. Each track leads you further away from humanity as the sky above grows ever darker, leaving you at the mercy of screaming diabolical tracks like “Purity of Wrath” and “Passage to Extinction”. Faint but noticeable choirs fight to be heard in the background above the fury waging below, rife with hammer pulsating drums and rabid dog snarls. Besides the catchier tracks like “Against the Flood” with its oddly perfect Power Metal riffs, and “Stillborn God”’s headbang worthy solo courtesy of Marcel Bangert, there is an untamable stamina in MINDREAPER that is unrelenting in the way the sound only picks up more speed as the album goes on. MINDREAPER comes for thee!